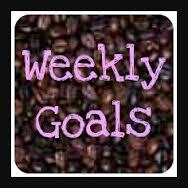 My first goal this week will be to stick to my running plan...for real this time. Although, I am fine that I substitute the elliptical one or two times, as long as it isn't instead of a speed/tempo workout or long run. The 3 is for week 3 over on the left. My other goal will be to just keep tracking everything. It is easy for me to get bored and lazy and just not write things down because I think I have been doing okay. I have serious food amnesia and rarely eat well if I'm not keeping a record of it somehow. 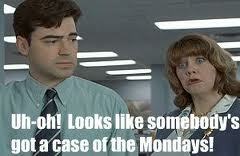 I definitely had a case of the Mondays today! Last night was rough! I was laying in bed when I started getting a lot of pressure in my stomach. I knew what was happening! About 7 years ago, I started getting acid reflux/heart burn (I really don't know the difference) really bad. At the time, I had put on quite a bit of weight and almost all of my meals (all five to six of them) consisted of fast food and soda. I started getting the worst pain right under my rib cage to the point I couldn't sleep or eat. I finally went to the doctor. She said that I needed to stop with the caffeine and unhealthy foods and prescribed an acid reflux pill that I would have to take every day. I was 24 or 25! I was too young to be on this stuff for the rest of my life! So, that's when I quit caffeine for two years and lost my 50 lbs the first time I did Weight Watchers. I stopped taking those pills after the first 30 ran out to see if I would be okay without them, and I was. I had a few flare ups over the years, but always after I had eaten like garbage. I guess my body doesn't appreciate all of the junk food the way I do. So, last night when I started getting the flare up again, I was hoping it would pass quickly. No chance! I was up until 4 am. The pain was just an insane pressure of what feels like built up gas and an acidy burning. I threw up a few times, but just felt like I needed to seriously fart or poop with no relief! I slept with a heating pad on my stomach. It makes me feel better somehow. And slept sitting up on the couch for a couple of hours before work. I still felt yucky for most of the day and have soreness under my ribcage and all I've eaten today was some pretzels, a bun, an orange, and of course water. I just really hope I don't have to go through this again tonight. On the funny side, Kevin asked me if I had made my goal yet. I was confused in my sleepy state, and asked what are you talking about? He said, you know, one stomach flu from your goal weight. Haha! 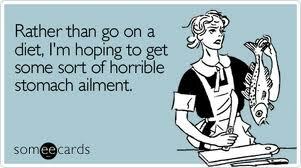 That's what I always say when I'm sick.